Is SharePoint good for ECM? It seems this is prevalent throughout the IT circles of larger companies (and even government). But, Iâ€™m mostly basing these comments on my own experience in the last three years or so. For some reason, many companies (mostly larger ones) donâ€™t really consider SharePoint a good ECM platform. In fact, even some SharePoint administrators are dismissive of itâ€™s ECM capabilities. Perhaps thereâ€™s been a quiet campaign against labeling SharePoint as an ECM platform or perhaps its just tough to leave the perception of SharePoint 2001 & 2003 behind. Yes, news was buzzing that â€œMicrosoft overtakes IBM in ECM MQ, WCM MQ, Horizontal Portals and Social Software for Workplaceâ€ all week. 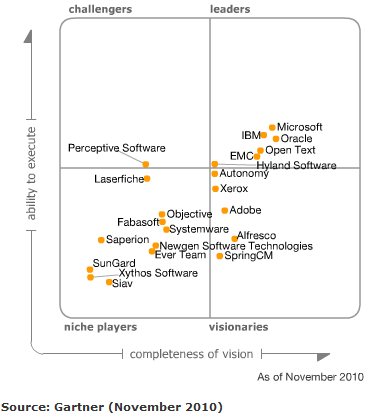 Products like Documentum (from EMC) and WebSphere (from IBM) have long been leaders however, I canâ€™t remember when either was a leader in all four categories above. Microsoft has done an excellent job of maturing SharePoint while IBM and others like Oracle, have done a very poor job of integrating their acquisitions to compete. For most companies, even the larger ones who truly have a need for ECM, I think SharePoint does the job well. Sure, Documentum or WebSphere may have a fancy feature that SharePoint canâ€™t deliver out of the box. This is where the true power of SharePoint comes in. SharePoint is a development platform so you could certainly add the needed functionality through custom code or a third party tool. The SharePoint ecosystem is wide and strong. I always refer to http://www.sharepointreviews.com for new or niche products to take a SharePoint feature to the next level. Even no code solutions exists, its simply a matter of creativity and discovery. For a recent example, take a look at Corey Rothâ€™s (@coreyroth) article: Spice up Your ECM with Ratings. When we talk about ECM, weâ€™re really talking about large amounts of data. So another trend of late is to outsource the hosting of that data: Cloud. I think Microsoft has a solid cloud platform (Office365) and itâ€™s hard for others to really compete there. 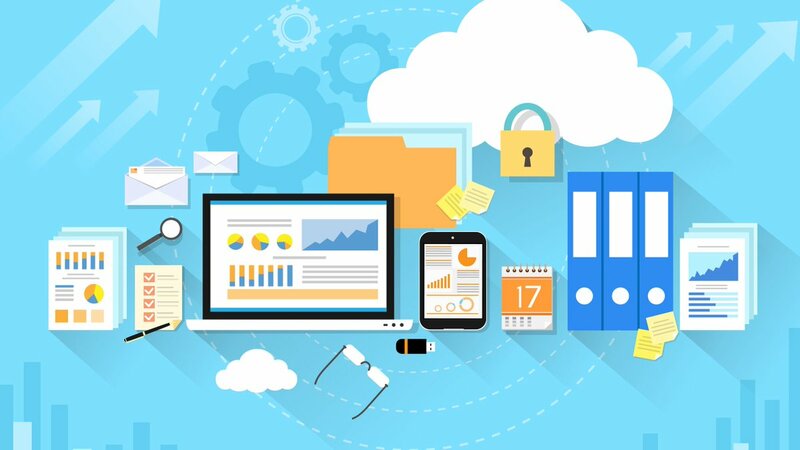 In my previous article, How Do The SharePoint Alternatives Stack Up?, I pointed at Google Apps as the cloud play. But as I point out in that article, Google is not really ready for enterprise. In fact, there are many stories of companies switching from Google to Microsoft (like this one, this one, and this one). Companies large and small are now using SharePoint to increase productivity and enable their workforce. I encourage companies large and small to take a look at what their competitors are doing by heading over to http://www.topsharepoint.com. This site primarily shows public sites, but you can be sure that most of these companies switched their internal sites (ECM/Intranet) to SharePoint first and then went public (WCM).